We specialise in the sale, installation, maintenance and repair of locks & safes and offer a comprehensive key cutting service. Cardiff Lock & Safe is a member of the Master Locksmiths Association and several of our staff are members of the British Locksmiths Institute. 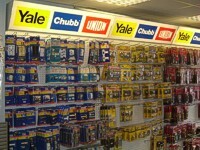 Cardiff Lock & Safe are stockists of specialist key systems such as Abloy, Medeco, Mul-T-Lock and Yale Pro-Key. Free no-obligation quotations in the local area with total confidentiality. Contact Cardiff Lock & Safe Company for all your specialist key, lock and safe requirements.